The product is value for your money. Staff is available to be contacted; easy to communicate with. 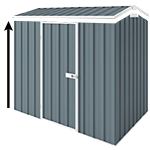 First of all as far as Cheapsheds are concerned, their service was excellent, this shed was cheapest amongst all the suppliers that I found, delivery was quick and was being updated regularly on the delivery. The shed looks great and blends in perfectly with other elements in my backyard, it is a decent sized shed as well - enough to keep most of your gardening and other tools inside. The biggest issue I had was with the assembly - there were quite a few pre-drilled holes that were not aligned properly so I had to drill it myself, fortunately I had all the tools with me. The manual was alright but certain sections of the manual had explanations with a different shed model that made it difficult for me as the one that I had was significantly different from what was mentioned in there. Communication with the staff on the chatline was great before and after I bought the shed. I can't fault the service there. The shed arrived earlier than expected. In fact, it arrived even before the email informing me that the shed had already been delivered to the depot. However, only half the shed arrived. It did not come with the side walls. I hope that the pre-drilled holes match as the panels were obviously not made at the same time. We are extremely happy with our purchase, it wasnt too hard to put together, it suits our yard perfectly and I love the colour, we have already had comments on how great it looks! The shipping was super fast and the customer service was awesome!